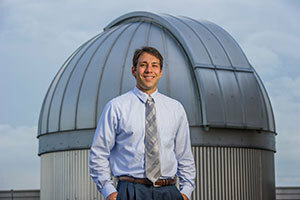 Justin Crepp, the Freimann Assistant Professor of Physics at the University of Notre Dame, has published a study Thursday (Nov. 13) in the journal Science that details how next-generation planet-hunting instruments will benefit from advancements in infrared technology that change how astronomers capture starlight. At infrared wavelengths, it becomes possible to sharpen the blurry images normally received by large ground-based telescopes. This influences the design of astronomical instruments. By correcting for Earth’s turbulent atmosphere, researchers can dramatically enhance the sensitivity of techniques that reveal the periodic pull of a planet’s gravity on its parent star. Adaptive optics act like a pair of glasses for telescopes to improve image quality: “The telescope collects the light; the glasses correct the light,” Crepp said. To find the faint signal of an extrasolar planet, astronomical instruments must also be located far from the telescope’s environment to avoid vibrations, and temperature and pressure changes. “We use optical fibers to accomplish this, much like the telecommunications industry delivers Internet service to your home.” However, most fibers suffer from an internal source of noise, which is called “modal noise,” resulting from the light interfering with itself. Using adaptive optics, scientists can instead direct the light into single-mode fibers, tiny wave-guides whose diameters are smaller than the width of a human hair, to provide a pure signal that avoids modal noise altogether. The technology means that scientists will be able to calculate the mass and density of planets, comparing their properties to Earth to assess whether they are rocky or have a substantive atmosphere. “Whenever we make instruments that work at other wavelengths, we make discoveries,” Crepp said. These very same technologies will be used by the iLocater spectrograph, a planet-finding instrument being built in Crepp’s laboratory in the Department of Physics at Notre Dame. The iLocater spectrograph will be installed at the Large Binocular Telescope in 2017. Originally published by Gene Stowe at news.nd.edu on November 13, 2014.